2pro disposable prophy angles feature unique dual-action dental prophy cup and tip design which enables optimal access to all tooth surfaces. 2pro fits nose-cone straight handpieces and is available in 4 cup styles (soft/short, firm/short, soft/long, and firm/long) and a variety of colors. Works well, point gets into small pits and grooves. 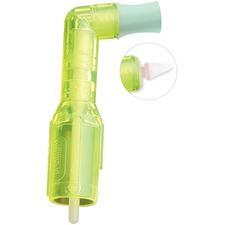 Great little disposable prophy angle, smooth running,reliable, jam free. The compact head of the 2PRO has a flexible rubber cup that really holds the prophy paste while easily contouring around those difficult line angles of rotated teeth. Surprise! Pop off the rubber cup and you have a rubber tip tool for getting around brackets, bands, distal flaps on thirds, implants and bridgework. 2PRO puts other disposable prophy angles to shame. Musta been invented by a dental hygienist ;)! I switched to 2Pro Disposable angles after trying a sample. The bright colors are great, but that's not why I love them. I love how smooth they run, and love how you can take the cup off and use the tip for interproximal areas and especially for ortho patients around brackets. I like to use these angles on my patients that have ortho brackets. You can use the regular cup for the lingual surfaces and then take that off and use the cone shaped angle to go around the brackets. I don't use this on every patient because they are more expensive and the cup doesn't move as smoothly as my contra angle.